Why Marmite can help improve anxiety and stress. 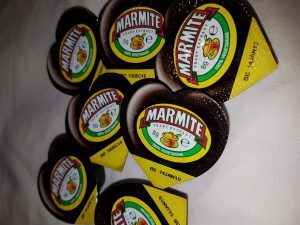 So, whether you love or hate Marmite – and what a wonderful piece of advertising that is – it turns out that Marmite has been found to reduce anxiety. It’s true – if you pop a yeast based spread (YBS) like Marmite, on your toast in the mornings then you will experience less anxiety and stress than those who didn’t. Unfortunately, if you suffer from depression it’s not going to help though. The reason why it’s thought to be so good are the B vitamins that it contains. B6, B9 and B12 help to regulate the neurotransmitters in the brain that control our moods. Whilst Vitamins B6 and B9 are commonly found in a variety of foods, B12 is mostly found in animal products so if you are vegan or vegetarian Marmite could be particularly important for you. I have to say that whilst I don’t love Marmite it can be pretty nice when spread thinly. One of my favourite meals is cheese on toast spread with a little Marmite and butter on top after it’s been toasted (definitely not before). It’s delicious and I recommend everyone who loves Marmite experiments with this. So, if you’re feeling a little jittery… you know how to give yourself a nutritional boost.